As players across England prepared for this weekend’s FA Cup third round, strict protocols would have been followed to aid their preparations. Late nights out would certainly have been off the agenda. Here is an FA Cup tale that took place in a different era almost half a century ago, when a band of West Ham team-mates – including the only man to captain England to World Cup glory – misjudged the consequences of throwing caution to the wind. It’s told from the memories of one of those involved, Clyde Best, who 50 years ago this season became one of the first black players to star in the English top flight. It was 1 January 1971 and West Ham had been drawn away to First Division rivals Blackpool in the third round of the cup. It was close to freezing as the players took the train to the north-west on the day before the game. “Once we had settled at the hotel we learned that the referee was going to call off the game,” Best, now 67, tells BBC Sport from his home in Bermuda. That was the cue for senior players Bobby Moore, Jimmy Greaves and Brian Dear, along with 19-year-old forward Best and club physio Rob Jenkins, to order a taxi and head to Brian London’s nearby 007 Club. Former boxer London was a friend of Moore’s and ran several clubs in the area. “Blackpool was quite a destination for footballers, a lot was going on. I remember 007 was a really nice place – one of the best in the town,” recalls Best. Much to their surprise, the match went ahead the following day. On a slippy Bloomfield Road surface, West Ham were torn apart by Scottish midfielder Tony Green as the Tangerines, led by new manager Bob Stokoe, ran wild. “Green was on a roll – I never saw anybody play on ice like that. He was like a ballerina, you thought he had a pair of ice skates on. He was brilliant that day and they ended up beating us,” Best continues. Despite only a few points separating the teams in the table, the Hammers were expected to defeat a side who were relegated a few months later. Instead they suffered a humiliating 4-0 loss. Worse was to come when a fan told newspapers that he had spotted the group at the nightclub – and Monday’s headlines made for ugly reading for all concerned. One report stated that a hotel porter saw the players actually leave the hotel at midnight and return at 2am. It goes without saying that West Ham manager Ron Greenwood was unimpressed. “Ron was quite a quiet fellow, but if you upset him and did the wrong thing you’d suffer the consequences,” says Best. “We were all called into the office that week. The guys held their hands up and were counted. They said they were drinking, but admitted that I hadn’t touched a drop. Best, Moore, Greaves and Dear were also fined a week’s wages and physio Jenkins was given a severe reprimand. Moore – a national hero after skippering England to World Cup success at Wembley in 1966 – was now facing one of the most difficult moments of his playing career. Speaking in 1985, Moore recalled: “It was a completely innocent couple of hours. We only drank two or three glasses of beer. Best drank orange juice. 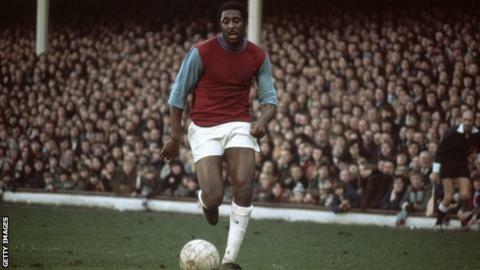 Moore’s relationship with Greenwood and the club soured and he eventually left for Fulham in 1974 having been at West Ham for 18 years. Dear and Greaves departed at the end of the 1970-71 season, while Best was retained and went on to score a total of 58 goals in 221 appearances for the Hammers before he left in 1976. “It was just a blatant mistake that could have happened to anybody, but we’ve had to live with the consequences for the rest of our lives,” adds Best. It hurt the Bermudian that Moore, the man who helped look after him when he arrived from the British Overseas Territory as an 18-year-old, had, in his opinion, been treated poorly by the club in the aftermath of the incident. Best adds: “If I had to make a decision he would not have left the Hammers for Fulham. “When you have a person like him so valuable to the team and everybody adored him, you keep him and don’t just disregard him. “The papers probably tried to take him down, but Bobby was such a strong-willed person. He’s one of the best defenders I’ve ever seen. Best played at a time of high racial tension in Britain following the influx of immigrants from the Commonwealth during the 1950s and 1960s. He suffered abuse almost at every stadium away from Upton Park – “it’s just how it was” – but says he will never forget the support of his team-mates. “Bobby was a great help, as was Harry Redknapp, Billy Bonds – they would encourage me to keep going and told me not to let them get under my skin. “They also told me how brave I was and that they would have packed it in. But I felt I had a calling, so to speak, something I always wanted to do and nobody was going to stop me doing it. “The most important thing was I had to think about all the people of colour working in England at the time and by seeing me on TV or the newspapers I inspired them. Best notes the alleged abuse recently directed at Manchester City’s Raheem Sterling and offers this advice to the England winger: “Block it out. It’s going to happen because that’s the way the world has turned. Best went on to play for Dutch club Feyenoord, a string of clubs in North America, and tried his hand at coaching before eventually retiring in his home country. He never got to meet his friend and mentor Moore again in the years before the England legend’s death in 1993. “I was coaching in the USA when he passed away. It’s a shame I never saw him, but those things happen in life. It’s something you have to accept and just go on,” Best added. “If I could say something to him I would say, ‘Thank you for helping me with my development’.